The British band Raygun has just completed the Manila leg of their Asian tour. 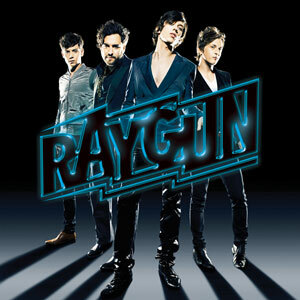 Five lucky PEPsters will get the chance to win a Raygun CD, a shirt and a poster. CLICK HERE to join the online promo. NewBritish band Raygun has recently visited the Philippines to conclude theirAsian tour and to perform for the Manila crowd. In a press conference held at the Crowne Plaza Hotel held lastOctober 19, Raygun members—Ray Gun on vocals, songwriter The Adj on guitars,Ben Lyonsmyth on bass, and Sam Embery on drums—revealed how much they loved thesupport of Filipinos. In around-table interview with some members of the press, singer Ray Gun pointedout, "I think it’s been better here than it has been anywhere, really. Thewhole of Asia has been great. The whole way people have been really receptive.And people kept saying, ’Why don’t you stay longer? Why don’t you play moregigs?" he narrated contentedly. The other band members were also quick toshare their experiences with performing live in the Philippines. Duringtheir October 18 performance at SM North Edsa The Block, the band shared howthey were overwhelmed by the number of people in the event, and by the amountof support given to them by Filipino fans. "How manypeople there, like 300 people or something?" Ray Gun asked his bandmates. "It’s quite a lot," replied drummer Sam Embery. "We weren’t necessarilyexpecting so many people to turn up. It’s quite overwhelming, really. We’ve gota little signing afterwards. We got to meet some people. It’s just great." The bandalso shared that while in the Philippines, they tried the local delicacy sisig, a Pinoy delicacy made from chopped parts of a pig’s head. "We didn’t realize what it was," explained Ray Gun, as all ofhis bandmates chuckled at the memory. "It’s great, though [and] it’s good withbeer, isn’t it?" FUN IN MUSIC. Raygun describes their music as"theatrical pop" because onstage "it’s all in the kind of over-the-topperformance," explained singer Ray Gun. He told PEP (PhilippineEntertainment Portal) jokingly, "We definitely wouldn’t stand there and play guitars,and stare at our toes." The bandalso shared that aside from making music together, they all love to make eachother laugh. "We have a common interest in humor. We like to make each other laugh, always doing silly things. I think we have alot of in-jokes, as well," said their vocalist. The bandrecently did a cover of Shakira’s "She Wolf" and Madonna’s new single"Celebration," which they posted on their MySpace account. Do they usually docovers of popular songs? "We don’treally, but we like to hang out in our basement and play covers now and thenjust to unwind sometimes," revealed Ray Gun. "It’s cool to take current musicand just give it our own little spice. So now and then we’d record a cover songfor a laugh, and just put it on the internet. But there will probably be more,as well, at some point," he laughed. Ray Gun added that they choose the songsthey cover because they don’t want everybody to think that they are a "strangecovers act." As for doing covers of popular songs, the vocalist added, "[It’s] better totake something that is completely unrelated to what we do, and make it our own.That’s how you learn about music." MUSICAL INFLUENCES. In the same interview,Raygun enumerated a number of bands that have been a huge influence on theirmusic. "There’s a strong foundation of bands based in the late ‘60s and early‘70s that we’re really into," replied Ray Gun to the question posed by PEP. "Sowe kind of base our music around the sounds of David Bowie, Rolling Stones, LedZeppelin, The Beatles, and Motown stuff, as well." He also listed TalkingHeads, Roxy, and Queen as the band’s musical influences from the ’70s. "And whenI’m playing and writing, I’m genuinely not trying to sound anything like thosepeople," added The Adj, Raygun’s resident songwriter, noting how his music justsometimes ends up sounding similar to the music of such bands. "All musicis related anyway," continued Ray Gun. "Every artist from the ’60s wasinfluenced by Elvis Presley. It all kind of filters through, doesn’t it? Ithink we’ve chosen probably the best artists of that time. Just good quality,isn’t it?" "It’snever, ’We are gonna be like this, ’Were gonna take that element’, it just whatcomes naturally, because we grew up on those records," he justified. "All ourparents have those records. When you were kids, you must have gone through yourparents’ record collection, don’t you?" FILIPINO RECEPTION. Granted that all ofthe band members loved their stay in the Philippines, when can Filipino fansexpect them next? VocalistRay Gun answered, "We will play more gigs as soon as people know about thealbum, buy the album, and want us to come back, we’ll be here." With Philippines being the final leg of their Asian Tour, Raygun flewback to their hometown in England last Tuesday, October 20. PEP PROMO. Five lucky PEPsters will get the chance to win a Raygun CD, a shirt and a poster. Deadline of submission of entries is on October 25, 2009. CLICK HERE to join the online promo.